Explore the Best Zoomcar Offers/coupons and Car Rental Deals this April 2019 at Prices Like Never Before. Xerve Offers You Verified Voucher/promo Codes and Discounts on Self-driven Cars at Rent for Users Across Bangalore, Goa, Hyderabad, Chennai, Pune, Mumbai, Delhi/ncr, Kolkata & More. Avail these Amazing Offers on Zoomcar to Enjoy Your Weekends with Family. Book a self driven car and make your travelling easy. 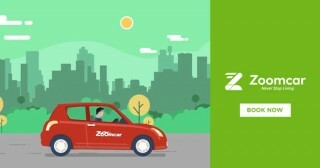 Zoom car -India's first car rental service focuses on privacy and freedom. Having started with just 6 cars in Bangalore, and as of 2017, they have grown to manage over 3000 cars in 17 cities across the country. Zoom car lets you rent a wide range of budget-friendly to luxury automobiles for a casual outing with friends & loved ones, to a long drive away from the city. . In this digital age, everything happens with just a click so get over those traditional means of renting a car. Find the best coupon & offers for your trip with Zoom car on Xerve and 'never stop living'. If you wish to travel in the city with you behind the wheel or go outstation then get a self-drive car rental and you are good to go. Check for latest Zoomcar Offers and deals on this page before you Rent a car to get the best bang for your buck.